Rous Water is the bulk water provider responsible for supply, delivery and management to communities across the NSW Northern Rivers region. A member of the Northern Rivers Science Hub, Rous Water delivers a range of educational programs for schools and community members to help foster an appreciation of how we can all help save and protect our water supply. Among Rous Water’s programs are hands on challenges that can be undertaken at a water lab, guided walks at Rocky Creek Dam and activities that highlight aspects of the region’s Indigenous heritage. Community Education Officer Barbara Jenson runs Water Lab Wednesdays, a partnership project of Rous Water and the Department of Education & Communities, supported with funding from the NSW Environmental Trust Grant Program. During the school holidays, the Water Lab welcomes children aged 5 to 14 with their families to discover more about water with fun science experiments, investigations and games. In school term, the hands-on H2O Water Lab provides student-led water challenges to meet the needs of scientific investigations and fair testing from the new Science curriculum for Stage 3 & 4. 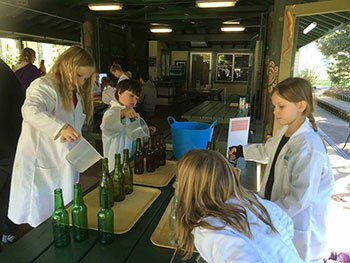 The Hands on H2O Water Lab is at the Dorroughby Environmental Education Centre where participants can make a day of water science fun followed by a picnic, play or bushwalk at the nearby Rocky Creek Dam. Anyone visiting Rocky Creek Dam will quickly appreciate the wonder of how the area’s unique environment creates natural water filters for the region’s water supply. Even more astonishing is the fact that thirty years ago, most of the area surrounding the damn was cleared for farmland. In the late 1980s, Rous Water established a bush regeneration team who began to reintroduce native flora and clear non-native trees, weeds and shrubs. As land was cleared, staff would plant the species that originally thrived in what was once a lush rainforest. Planting in circles, observing the change and what worked best, moving from patch to patch, the bush regeneration team over many years have brought a mighty rainforest back to life. Assisted by bats and birds whose droppings continuously add to the lush growth, the regeneration team discovered planting was not necessary. Instead they rely on the soil seed bank and today continue to focus on ensuring that the best conditions prevail to allow the natural cycle of rainforest growth to continue. With platypus swimming in the clear river and a beautiful boardwalk that weaves through a rainforest circuit, it is almost impossible to imagine that none of the glorious rainforest vegetation was there forty years ago. Barbara says that Rous Water’s commitment to educating the community about protecting water quality supplies stems from a desire to plan responsibly for the region’s longer term water needs.